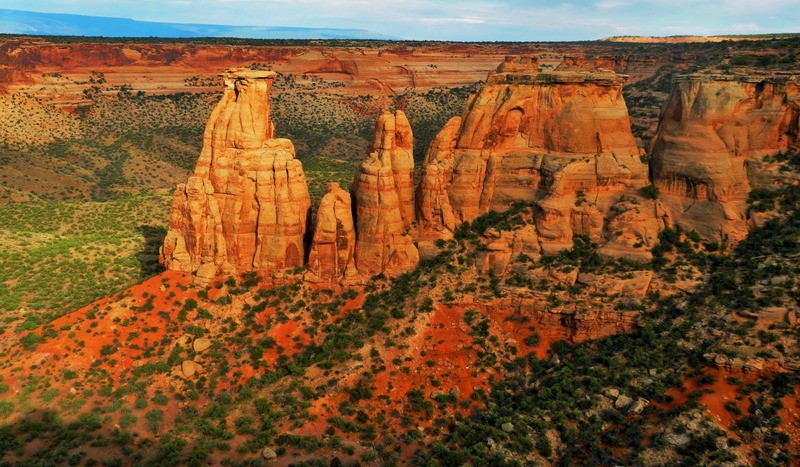 Why doesn’t the spectacular Colorado National Monument gain the popularity it deserves? Most likely because it is hard to compete with the nearby celebrities like Grand Canyon, Arches, Canyonlands, or Rocky Mountain National Parks. Possibly because its status of national monument is not as appealing as status of national park. But this is all good for those who venture there. They will be awarded not only with outstanding vistas but also with a solitude so difficult to find elsewhere. Ever since my first trip to Utah and Arizona over twenty years ago, I fell in love in with the red rock landscape. 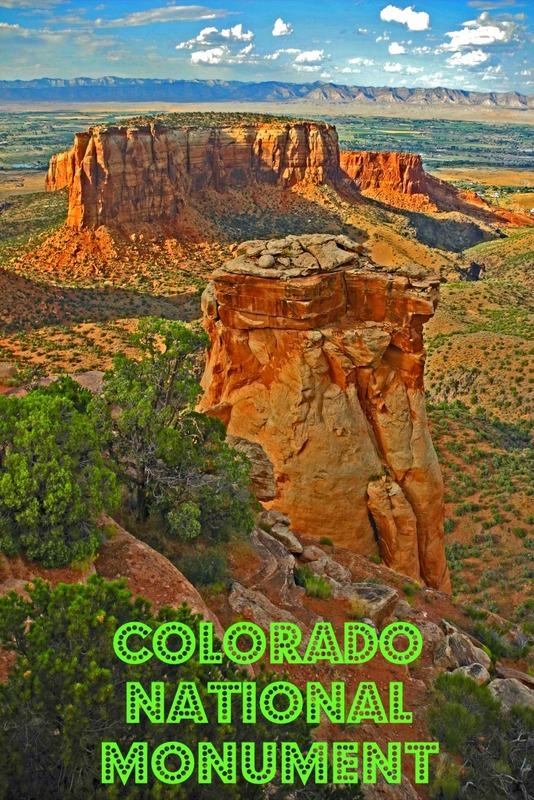 So when a friend invited me to spend two weeks in Colorado, I immediately though of Colorado National Monument, known for its red rock formations. She agreed to make it a stop during our road trip. With just a few hours there, I realized that we did not devote enough time to spend there. It is a unique and beautiful place! He kept his promise. He lived alone in the canyons and used a pick and shovel to carve out the trails. With help of photographers and local officials, he spread his enthusiasm all the way to Washington. 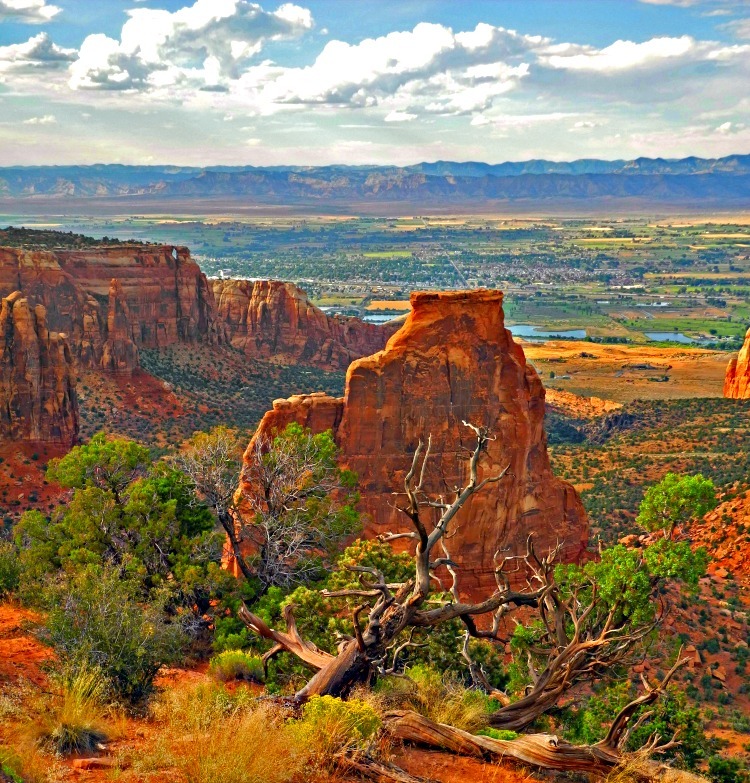 Ultimately, Colorado National Monument was established on May 24, 1911, as a presidential proclamation by President Taft. 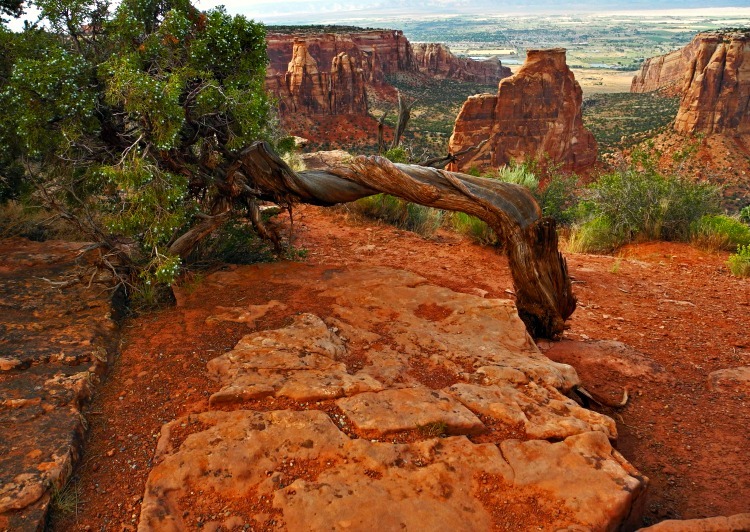 Colorado National Monument is practically a city park. It is easily accessible from the nearby towns of Grand Junction and Fruita. From there, it takes no more than a half an hour to reach the park. Yet once you enter it, you can easily forget that you are just a stone’s throw away from traffic lights, malls, hotels, and restaurants. Magnificent views stretch from the colorful sheer-walled canyons and fascinating rock sculptures to the distant Colorado River valley, and the huge flat-topped mountain called Grand Mesa. The park hosts a wide range of wildlife, including red-tailed hawks, golden eagles, ravens, jays, desert bighorn sheep, and coyotes. 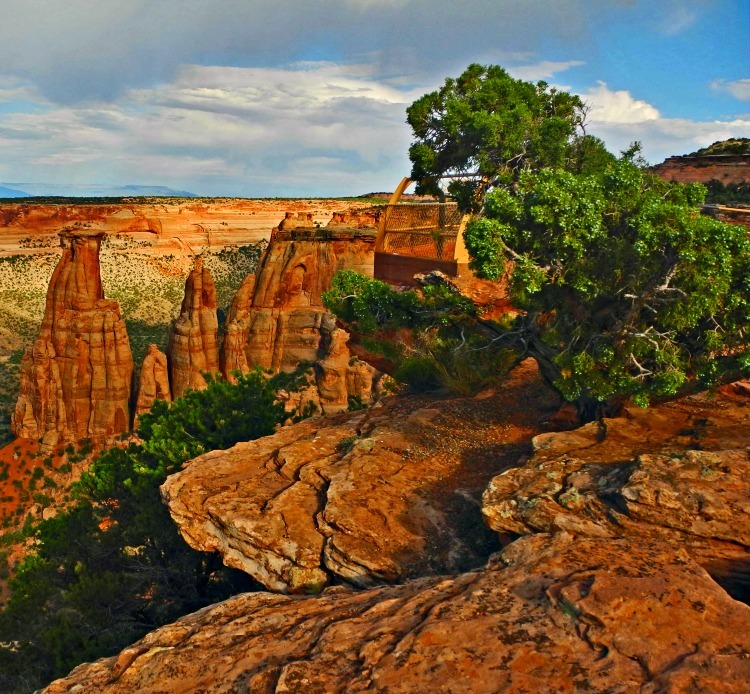 Colorado National Monument provides an 80-site campground open year-round. It has rest rooms with flush toilets and sinks, drinking water, charcoal grills and picnic tables. Sites are suitable for tents and recreational vehicles, with some pull-through sites. Backcountry camping is also permitted. A free permit is required and may be obtained at the visitor center. For those seeking modern conveniences, numerous hotels are available in Fruita, Grand Junction, and the surrounding area. The visitor center is a good place to start. It is located four miles from the Fruita Entrance and near Saddlehorn Campground. Here you will learn how to visit the park within your time frame. You can also get maps and see two short movies about the park. We took Rim Rock Drive to get a taste of the park. 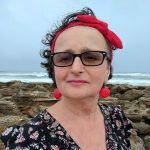 It was an interesting experience – to say at least! In many places, the road was dancing on the edge of the cliff and there was not much protection from falling over! Almost 23 miles of this can get your heart pumping! Road biking is allowed the but it is challenging. There are many overlooks along the way, each of them worth stopping. My favorite part was Grand View Overlooks. The rock formations there were spectacular! This stop also provides panoramic vistas of the valley below. There is much more to see and do in park. You will find great hiking along trails ranging in length from a quarter mile to more than fourteen miles. I definitely underestimated the time needed in the park. I suggest to allow at least two full days to fully appreciate the Colorado National Monument. When we visited, on a gorgeous summer day, the park was practically empty. This lack of popularity triggered a debate whether or not the area should be promoted to a national park. Many are hoping that with the new status the park will attract more visitors. Others argue that statistics from our newest national parks do not support this theory. 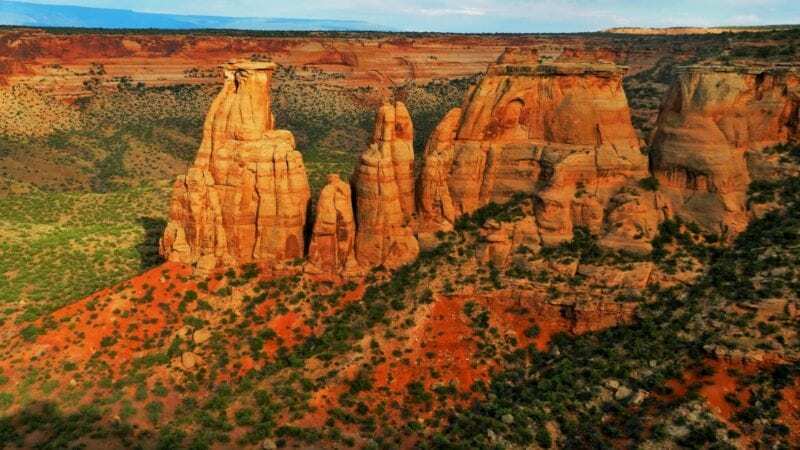 In my opinion, places like Colorado Monument suffer because of their proximity to spectacular well known national parks. Put this park in any less attractions packed area, it would be overflown with crowds. For me, the lack of people was just a bonus. I enjoyed my visit there very much and would like to come back to explore more.